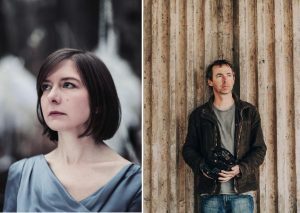 Emily Portman & Rob Harbron are two of the finest and most distinctive performers on the British folk scene. With multiple accolades for their years of work in different collaborations, now they have formed an inspired new collaboration. Together they create a boldly stripped-back and intricately woven sound, exploring traditional song alongside new writing. Emily (voice, banjo) is best known both as an original song-writer and for her work in traditional song band The Furrow Collective. Rob (English concertina, guitar, voice, fiddle) is known for his work with Leveret, Fay Hield & the Hurricane Party, Jon Boden and many more, being in great demand as a uniquely skilled concertina player as well as one of the finest multi-instrumentalists in the country. Together they explore the traditional music in which they are both steeped, mining the archives for hidden gems and offering their own original contributions. Emily’s unaffected voice combines with Rob’s sympathetic musicality to startling effect, creating an unforgettable live experience brimming with subtlety, depth and a shared love of the music.